Napa California: Which Wineries Should You Visit? Wine. We like wine. You probably like wine as well. But if you’re anything like us, you don’t know a lot about wine. As delicious as it is, it can be intimidating. There are so many regions, grapes, and processes involved and a dizzying array of options to choose from and understand. During our trip to Napa, we learned a lot about the science and technics that go into producing wine. We barely scratched the surface though. We were there for two days and toured four wineries. But since there are over 700 wineries in the Napa region, we still have plenty to see and taste on a future trip. Keep reading to see what producers we visited and what you should know before visiting Napa California. The cellar at Del Dotto. Our first stop was Del Dotto Estate Winery for a cellar tour. The cellar at Del Dotto is a recreation of a centuries-old cellar in Italy. They hand-selected the marble and tiles, had them shipped to Califonia and then put the whole thing back together. The cellar was quite peaceful. Since it was the low season, we pretty much had the place to ourselves. Our host used a wine thief to retrieve our tastings straight from the barrel. He also taught us the difference between French and American oak. French oak barrels have less sap in the wood, so it affects the wine more subtly. American oak has a lot more sap, so it's mostly used to age whiskey. Who knew? We should have bought one of these suitcases to bring home some wine. The wine thief retrieving our tastings from the barrel. We had some snacks after the tour. All of Del Dotto's wines were fantastic, but strangely enough, our favorites were the most expensive ones. Funny how that works out. We learned a lot about the barrel making process and how they age wine on our tour. We finished up with snacks, port, and chocolate. The cellar tour at Del Dotto was one of the most unique experiences on the trip. Tasting wine directly from the barrel was fun and started our Napa trip on the right foot. We don't drink a lot of sparkling wine, but after our trip to Domaine Carneros, we're going to start. While Domaine Carneros produces other red wines, they are known primarily for their sparkling varieties. We did a wine and food pairing in their glass observatory. The food was as impressive as the view. The meal was fresh, and the flavors were all Asian inspired. It was eyeopening trying the different wines with the single small bites. The tastes changed depending on whether you drank or took a bite of food first. And of course, each wine had a unique flavor with each dish. After the meal, we toured the factory. Sparkling wine has different production needs compared to other wines. One of the coolest things we learned was how they remove the excess yeast from a wine bottle. After the yeast has produced the alcohol and carbonation, the bottles are slowly turned upside down, so that the sediment gathers in the neck. Then they freeze the particles, and it forms an ice block. After that, the built-up carbonation shoots the frozen cylinder out of the bottle. I imagined that this all happened dramatically, with tons of ice bullets flying all over the place. The truth is that it all occurs benignly in a stainless steel tube. Still cool though. Domaine Carneros was a great start to our second day. Our next stop was the Chimney Rock Winery. 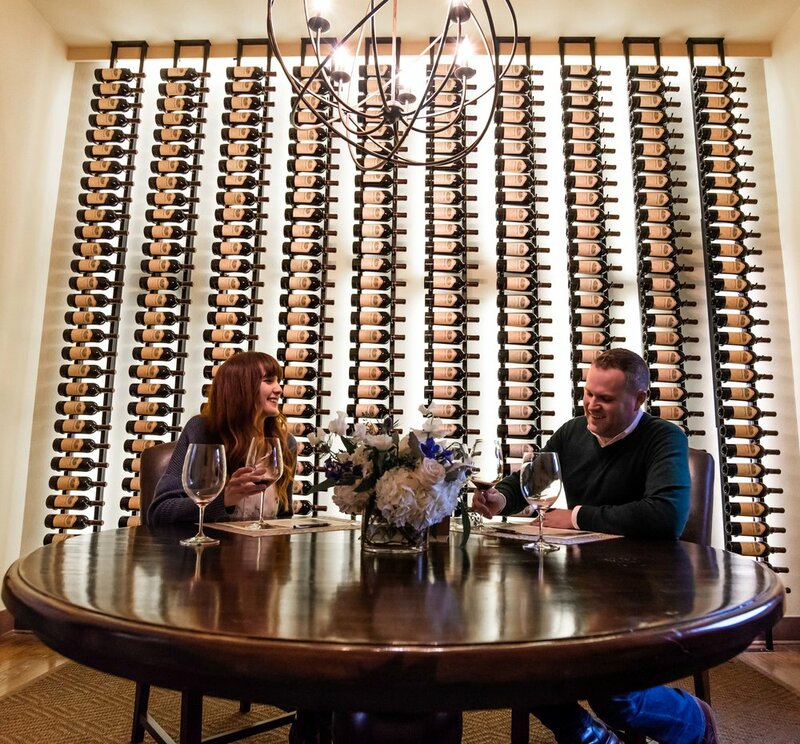 They differentiate themselves by being one of the few true estate wineries in Napa. That means that they grow and harvest all of their own grapes. They also don't use machinery to press their grapes for the juice. They allow gravity to force the liquid from the fruit slowly. They feel this creates a more vibrant flavor in their wines. This barrel was made from a tree planted in 1655. Our guide took us through the barrel room, the production vats, the vineyard itself and finally the V.I.P room to open some bottles. Napa is known for Cabernet, and that happens to be our favorite wine. Chimney Rock produces some amazing Cabernets. We tasted several, but something that stood out was a side by side we did of two wines. They were both identical except for the fact that one was aged longer than the other. It was incredible how this one change made such a big difference in the flavor. Chimney Rock was a fun and intimate tasting experience. Oh, and once again, our favorites were the most expensive. Del Dotto family has a couple of wineries in Napa. The final stop on our trip was to their Piazza location for what they call "The Poppers" tour. It was another food and wine tasting but this time with small bites and red wines. My favorite snack was the duck meatball, and Charise loved her vegetarian cabbage roll with truffle. The food was excellent, and just like our other food pairing, it was surprising to us how much the flavors were affected by the paired wines. After the tasting, we toured the Piazza's cellar. Much like the Del Dotto Estates cellar, it had a very Italian feel. However, it was brighter and felt larger than at the Estate. We visited Napa in February, so the grapes were dormant; however, all the vineyards had a naturally occurring mustard groundcover. We took a walk through the lovely yellow vineyard as the winery and our time in Napa was closing down. You might be wondering which winery was our favorite. I wish we could tell you, but since each stop on tour was so different from the other, it's hard to pick just one. We had an amazing time in Napa, and at all the wineries we visited. While indeed not an extensive tour of the Napa Valley, you can't go wrong visiting any of the wineries we stopped at. The service and the wines we were served were perfect. What do you think about the wineries we went to? Have you ever traveled to Napa? Let us know below in the comments. Disclosure - We received support from Del Dotto Estate, Domaine Carneros, and Chimney Rock Winery. We won’t be jerks with your email address. We won’t sell it, and we won’t flood your inbox.